With the recent news from Lucasfilm announcing the true state of the Star Wars Expanded Universe, canonically, we as fans have been forced to come to a new reality. From where we now stand, Star Wars is an open and largely unwritten book. For some, this is a welcome change; for others, it is a crushing blow. Nevertheless, the one point that most of us can agree on and look forward to with anticipation is Star Wars Rebels, and the slew of new characters it will enter into the ranks of official Star Wars canon. The one character that I am most looking forward to, however, is the one that has been barely touched on…and that latter fact alone, in my opinion, makes him all the more important to the series. In the months that news of Star Wars Rebels has been circulating, and amidst all the character videos introducing the protagonist crew of the Rebel ship, The Ghost, the enemy has remained, for the most part, curiously untouched. Apart from a short video by Dave Filoni acknowledging the Empire’s presence in the show, virtually no information about the tyrannical and smartly dressed antagonists has been released. All we have, really, is a picture of the primary villain…but in this case, a picture truly is worth a thousand words. Behold, the Inquisitor. Black armor, a double-bladed lightsaber and Force disk, burning yellow irises, and (as of yet) no name. These, along with the information on the Inquisitors developed in the Expanded Universe, are all we have to go on to decipher this character’s psyche, his agenda. And yet, this “iconic villain,” as Filoni himself titled him, has the potential to become one of the greatest villains in the Star Wars universe. The reason for this hypothesis? Simply, the lack of information; the wait, the curiosity, the excitement, the build up…. It’s all leading up to the reveal of what is meant to be the quintessential embodiment of evil, the next generation’s Darth Vader, if you will, for a new era of Star Wars fandom. The potential is astounding; the amount of depth possible for this character, nearly endless. His very background as a member of the Inquisitorius, the highest order of Dark Force Adepts at Emperor Palpatine’s disposal marks him as an enemy of epic, lethal proportions. 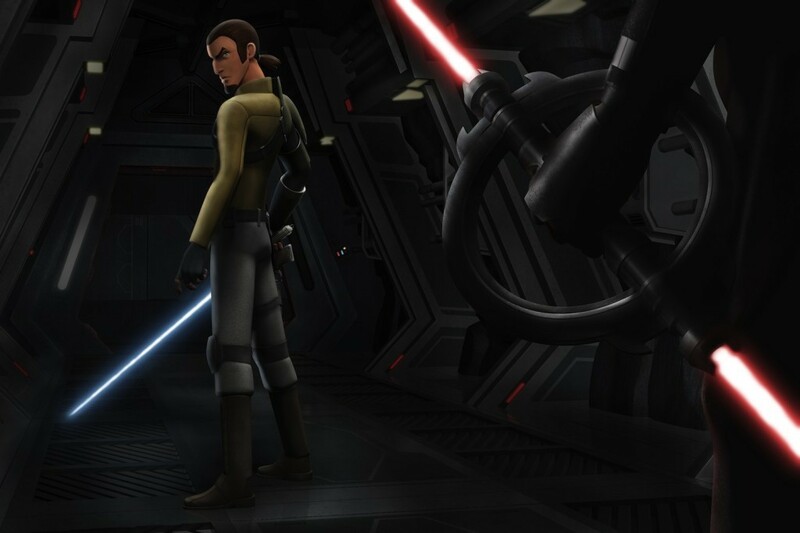 But more than that, if this background is combined with interactions with former Jedi like Kanan and the original trilogy influences that Filoni and co. are weaving into the series, the Inquisitor could bring dramatic tension and personal conflict to Star Wars Rebels that could rival even the inner struggles of Darth Vader, which we saw in Return of the Jedi. The latter may seem a bold claim, but I assure you, it is not inconceivable. A bit of background information on the Inquisitorius itself should help prove it. The Inquisitors of the Empire were perhaps the most important among Darth Sidious’s adepts, for they were given the overriding purpose of hunting down Jedi that had managed to escape Order 66. Force sensitive beings discovered by the Empire were admitted into the Inquisitorius only after passing rigorous tests. Only then, once an adept had proven himself fit for admittance, would he be trained by Darth Vader, himself. This exalted order was comprised not only of previously untrained Force-sensitives, however,; there were also Jedi present in the Inquisitorius’ ranks. These Jedi were either volunteers (such as Jarec, an Inquisitor best known for his villainous work in the game Jedi Knight: Dark Forces II) or had been forced into conversion to the Dark Side by other Inquisitors. In fact, this conversion process was a critical part of the confrontation between an Inquisitor and a Jedi. Whenever an Inquisitor found a Jedi, his first goal would be to turn the Jedi to the Dark Side of the Force. If this, for one reason or another, could not be done, only then was the Jedi to be eliminated. 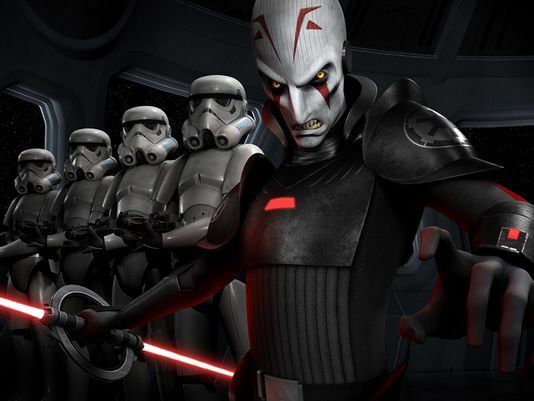 It is true that Filoni and his team are under no obligation to pull from the Expanded Universe to develop a history for the Inquisitor, or even the Inquisitorius itself. But, on the other hand, who’s to say that they won’t? For myself, I am not ready to discount the information that exists in the EU, considering that Filoni already extracted the occupation and purpose (hunting down the remaining Jedi) of the Inquisitors from the same to use in the show. And the thought that the Inquisitor in the show could once have been a Jedi is just too tantalizing of an idea for me to pass up. First of all, it would mean that he was not necessarily always involved with the Empire and its evil. Secondly, it could leave the door open for him to develop more of an emotional foundation, such as having a personal connection to Kanan; perhaps they were friends as Jedi younglings, or perhaps (this is a bit more out there), they were even master and apprentice. Whatever the case, such a connection would give the Inquisitor character development further, and at the same time carve more depth into Rebels’ overall storyline in countless ways. For example, it would help set up the scene for how the Inquisitor discovers Kanan’s existence in the first place (“I feel something…a presence I have not felt since…”). Who knows, he might even be hunting for Kanan specifically. Such a perspective also lends a wholly different atmosphere to the photo of Kanan, saber out in readiness to confront the Inquisitor, that was released a few months ago. The history, the emotion, the FEELINGS that such a scene would convey! It’s getting back to the spirit of Star Wars, which is not just about people fighting physically, but is also about the feelings they’re fighting within themselves: the sadness, the hurt, the anger, the passion. It’s this inner struggle that brings us to what I feel is a theme centric to the original trilogy: redemption. The climax of Episode VI is when Darth Vader finally lets go of the Dark Side and throws his master, the Emperor, into the core shaft of the Death Star. He is able to defeat the darkness within himself and return to the light, despite having spent the last twenty-odd years murdering and torturing innocent people and immersing himself in the very abyss of evil. That point of redemption is one of the most beautiful moments in the entire Star Wars saga. And there hasn’t really been a moment like that since, in either the prequel trilogy or the Clone Wars series. That is a real shame, because this is a theme that needs to be repeated over and over and brought home for a new generation of Star Wars fans to see. The new generation needs to know and the old generations need to be reminded, that it is possible to go all the way into the Dark Side of the Force and come back out again into the light. I can think of no greater candidate that would carry this point across more poignantly than the Inquisitor, Star Wars Rebels’ epitome of evil. And if this were to come to fruition in the series, then not only would the Inquisitor be a great villain, but he would also be a great character. What with the lack of knowledge concerning just what influences Star Wars Rebels will take from pre-existing (and not necessarily canonic) Expanded Universe canon, only time will tell if Filoni and his team have decided to reach into the rich background of the Inquisitorius and use it to form a compelling, redemptive story for the Inquisitor that will live on infamy. Regardless, the potential of the Inquisitor should not and must not be underestimated. We are on the brink of a new age of Star Wars, and the Inquisitor is the villain that will carry us into it, much like Darth Vader carried us into the original trilogy and beyond.